Embark on your journey to Africa to uncover the rare jewels of the Rwandan caves in this gem-based 5 reel game. Jewel Journey cultivates symbols of stolen beads, sea snails and rare gems that can be combined to earn yourself some free spins. Guess the suit and colour in the in-game add on to win a maximum of 3 million gold coins. You can read more details below before you play slots. Founded in 1997, Eyecon burst onto the scene with the wildly popular game, Gore. The millions of downloads provided their base to begin building an online casino system and gambling games. Their first ever slot, Temple of Isis, released in 2003, remains a firm favourite with online gamers today. Fluffy Favourites, released in 2006 is their most successful game to date and remains one of the best online slot games available. Anyone can buy jewels for that special someone. But, venturing into a gloomy, danger-packed jungle in search of such treasure really shows you care. It’s easier than you may think thanks to one of Eyecon’s offering, Jewel Journey. You can also check out the best new slot games and see if this game made it in the list. Twenty-five play lines are here and five colourful reels. The reel tracks are transparent and we can see the scenic jungle backdrop from a high wooden bridge, the kind you don’t wanna cross, under which a long river flows. The reels are covered with pleasing, colourful symbols that reflect the jungle and a fearful expedition. There's our leader, a bespectacled Professor, twinkling crystals of various colours, trekking shoes, a water canteen, flaming torches, an Indiana Jones-style hat, a shiny hunting knife, the ultimate must-have, a map, a backpack to carry it all and a tiger. Aside from line up payouts, land five hats for a win of 150, or line up 4 knives for a win of 18 and such. Four of these symbols, the tiger, Professor, a purple coloured diamond and the map are scattered. All 4 of them pay two, five, fifteen or a massive hundred times your total stake, plus they each trigger a cool feature: The Great Escape - this is triggered when three or more tiger scatters appears anywhere. Now you have a choice to run in one of three different directions to escape the tiger. Win this and you can scoop 10x your total wager. Lose and... well you're the main course! Gem Select - Three or more of the map symbols land and you open Gem Select. You have 5 gems from which you pick one. If it matches the eyes of the statue, you can win 60x your total wager. If not, you win half, 30x your wager. Match and Win - Landing three or more purple gem symbols opens this feature. Pick gems until you reveal a matching pair, each of which awards a cash prize. Free Games - Here racking up three, four or five Professor symbols will earn you six, nine or even twelve free spins. Watch out for the Professor who appears on each free spin awarding a multiplier up to 12x. Note: None of the above three features (The Great Escape etc.) can be triggered during free games. The Purple Gem symbol subs for all other symbols except the Professor, tiger and map symbols. Your prize is doubled when the gem appears on a line win. Lastly, there is a Gamble feature: This pays out double or nothing on your last win. Choose one of two options in the hope of doubling your win. There is a maximum win of thirty two thousand coins or five correct picks. The reels spin smoothly and stop with a dull clunk. There is little more in the way of sound effects and no jungle drum soundtrack either. This dilutes the over all ambience the game struggles to create. But it's a niggle easy to overlook when freebies and cool features are on offer. Jewel Journey also boasts the potential to be quite a lucrative offering potential winnings up to nine hundred times your stake on every free roll. Click here for more slots promotions. 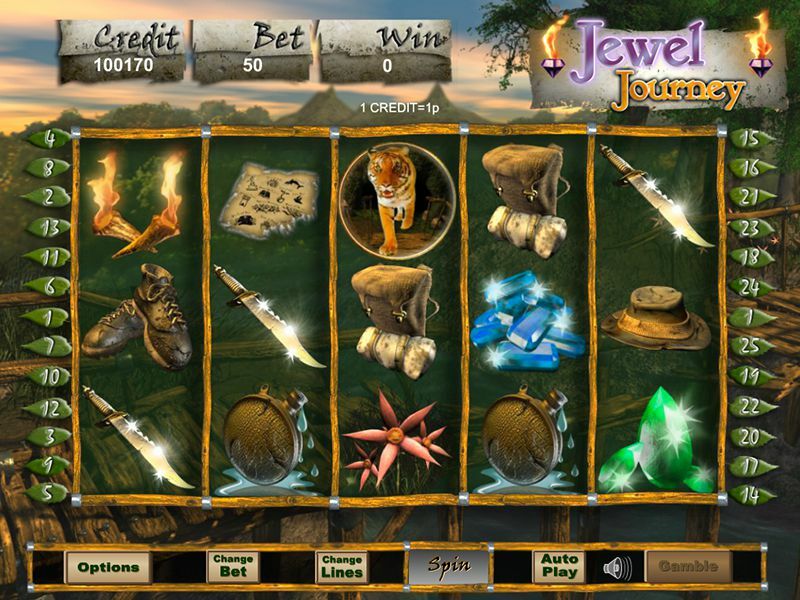 Jewel Journey is a graphically pleasing slot, easy on the eye. On offer are plenty of bonus features that play out like mini-games. Potential high wins included, this should find a good size audience and earn repeat visits from its fan base. Another hilarious game to try is our taco brothers slot.